My fourth favorite thing about being a parent? Visiting the library. I feel almost criminal lugging a half ton of books out to my car twice a week. Alice and I have established a tradition wherein we immediately camp out on the large "reading rock" behind the library. We sun ourselves like lizards and peruse the latest adventures of Cowgirl Kate and her pony Coco. However, as in all good things, the library is rife with potential disaster. Did you know that Babar, King of the Elephants had a run-in with cannibals on his honeymoon? Yes indeed, try explaining cannibals to a creature that doesn't understand the concept of death. We are still trying to ease her into the news that the "Chicken" she is eating and the bird she feeds at the petting zoo have a correlation. P.S. the Cannibals in question appear to be in blackface. P.P.S. The original Babar story includes a mother being shot to death, a favorite uncle set on fire, a beloved teacher bitten by a cobra, and the angel of death visiting Babar when he sleeps. Thank goodness Alice doesn't know how to read. I am trying to broaden Alice's understanding of the world as responsibly and gently as I can. I am leaning heavily on the maxim, WWFRD: What would Fred Rogers do? So I have been actively looking for books that tackle weighty issues. 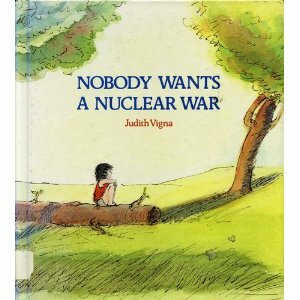 Last week I came upon a book called "My Two Uncles" by Judith Vigna. This seemed like a good starting place. There aren't a lot of LGBT friendly books at our local library so I snapped it up. Of course I read it first and I came to this conclusion, while Judith Vigna is willing to tackle difficult material, she is a stone cold bummer. I can't count the number of times I have read truncated versions of kid's books, quickly editing out the terrifying bits. Unfortunately kids can remember the exact wording you used last time the story was read and will complain if it changes. Any suggestions for new books to try would be very much appreciated.